Significant growth of education providers is testament to the growing demand for such programmes, says City's Regional Director for MENA and Director of Dubai Centre, Dr Kevin Dunseath. 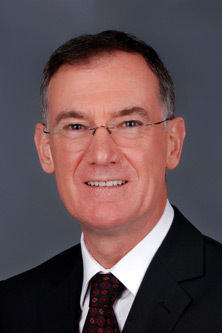 Dr Kevin Dunseath is City, University of London’s Regional Director for the Middle East and North Africa (MENA) and Director of its Dubai Centre. With more than 40 years of experience in international education, Dr Dunseath joined City in 2017 to lead the operations of the Dubai Centre, which since launching in 2007, has emerged as a market leader in postgraduate education in the MENA region. He spoke to City News this week about the various trends shaping executive education in the region and the role of the Dubai Centre in preparing students for the evolving job market. Why is executive education important? The key advantage to enrolling in an executive education programme is that it boosts your career prospects and opens the door to new opportunities. The typical career path for professionals today is no longer linear, so it is becoming increasingly important to not only acquire knowledge and skills, but also confidence, credibility and networks to be ready for new, and often unexpected, career opportunities. These five key attributes can be acquired or enhanced through appropriate executive education programmes. Is there a growing demand for such programmes in the GCC region? I believe so. There is a growing appetite among GCC nationals and expatriates alike. Evidence of this can be seen in the significant growth of providers in the region offering executive education courses and programmes of one kind or another - for example, there are currently 18 Executive MBA programmes offered in the UAE, 14 of which are based in Dubai. People are increasingly recognising that education does not stop with an undergraduate degree. In today’s fast-moving world, it is crucial that we regularly assess our capabilities and upskill ourselves so we can progress in our careers. What should prospective students in the GCC consider before choosing a degree programme? To begin with, it’s important to consider the status of the institution and who is going to be teaching on the programme. At our Dubai Centre, the quality of teaching is assured as our own faculty fly in every month to deliver the modules. Another crucial factor to consider is the accreditation of the programme– a qualification that is portable and internationally recognised will be more appealing, especially to expatriates, than one that has only local recognition. What are the key trends shaping business education? There is a growing focus on entrepreneurship, as the traditional dependence on jobs for life diminishes. Furthermore, rapid advances in digital technology, particularly in areas such as big data analytics, artificial intelligence and machine learning are reshaping the curriculum for business schools. However, there is an equally significant emphasis on the soft skills, such as critical thinking, creativity and teamwork. Another trend is towards increased internationalisation. So how is the Dubai Centre preparing students for the evolving job market? All of the master’s programmes offered through the Dubai Centre are designed specifically to meet the diverse needs of students in full-time employment. We aim to enhance not only the students’ technical skills but also their soft skills. These include communication, creativity, adaptability, teamwork, decision making, positivity, problem solving, critical thinking and work ethic. In interviews where candidates appear to be more or less equal in terms of their technical skills, there will always be perceptions on the part of interviewers about soft skills that will determine who gets the job. What does 2018-19 have in store for the Dubai Centre? An exciting year ahead awaits us.We are delighted to be already welcoming the first students on our new MSc in Airport Management. This coming March, we will launch our LLM in Maritime Law through our partnership with the DIFC Academy of Law. The addition of these two new programmes will mean that the number of degree programmes offered through the Dubai Centre will increase from four to six. It also means that three of City’s five schools (Cass Business School, the School of Mathematics, Computer Science and Engineering and the City Law School) will be offering degree programmes here in Dubai. In addition to these significant developments, we are also looking forward to identifying an increasing number of open enrolment and custom executive education opportunities in the region. One thing is certain: it will be a busy year for the Dubai Centre!